Whither the Pen and the Lesson Planning Book? One of the many new adjustments I made this year in transitioning to a new school was adapting to a new set of expectations and practices for how to communicate and share class materials online. For my first few years of teaching (from ~2004–2006, or so, I’d say), having a class webpage and posting homework, readings, and other resources was a decision left up to individual teachers. However, since that point, it seems as though all independent schools (granted, I have a very small sample size on which to draw, so don’t take my baseless speculation as gospel), have moved toward institution-wide content management systems (CMS) that all teachers must now use. I personally enjoy using these CMSs and having a centralized place for my students to go to get assignments, resources, and connect with one another in ways that go beyond the classroom. I often post materials there that I find interesting and are related to what we’re studying, but which I don’t have the time to share in the course of a class. Certainly, this blog has been an important part of my process of figuring out what methods and resources work the best to facilitate the type of classroom interactions and intellectual growth I strive to foster. However, much of the work that goes on within a CMS seems CYA-(I’ll let you look that one up for yourself)-oriented and administrative. Certainly, having up readings, PDF files, a calendar, nightly homework, and a venue for students to ask questions is undoubtedly important, and CMSs facilitate that. Nevertheless, they also change one’s workflow and can create new time pressures for teachers. All the transitions I made over this past year gave me a good opportunity to figure out whether and how I wanted to restructure the way I worked with my school’s CMS and what outside resources, if any, I wanted to incorporate. For the prior five or so years at my previous school, we had class webpages through a centralized CMS that also connected to the school directory, had gradebooks, and allowed one to bulk email students and parents. While this system was comprehensive, there were some aspects about it I found arduous and cumbersome. In response, I worked around those by using a cocktail of other websites and gradebooks. For a brief overview, here’s essentially what I did. I’ve written about, or at least mentioned, Edmodo a lot on this blog. The site was my go-to tool for communicating with students, posting assignments, posting resources, receiving and responding to questions, and having students communicate with one another from ~2009-2012. The layout of the site, its functionality, and the sophistication of what one could do with it really impressed me. Jeff O’Hara, the site’s founder, and the whole tech team at Edmodo worked incredibly hard to respond to user’s requests and suggestions. The aspect of the site I found most useful was the fact that students could configure their cell phones to receive text messages from Edmodo when I posted a new assignment or sent them a direct message. From my perspective, this accessibility created a higher degree of accountability for students, as I knew they had and used their cell phones frequently. The aspect of the text messaging feature students liked least my habit of posting all my weekly assignments en masse, which meant that students’ cell phones were barraged with a series of text messages they assumed were exciting, friend-related gossip, but just ended up being me preemptively harassing them about their upcoming work for the week. Ugh! However, when I planned my weekly assignments, I tended to do it in a traditional lesson planning book by hand first, which allowed me to figure out the pacing and sequence of the week. After I’d hand-written a general set of assignments and activities, I’d then post each night’s assignment and relevant links on Edmodo. For some reason, I found the process of hand-writing that material first more helpful in thinking through the week then just typing out the assignments on Edmodo and posting them directly. So, with such a glowing recommendation, why would I consider switching to something else? Using both Edmodo and my prior school’s official CMS essentially was double work for me. Certainly, I chose to do this double work, but so many of the features of Edmodo were things that I wasn’t able to do with my official CMS, so I was willing to do all the copying, pasting, and clicking in order to mesh the two systems as best I could and get the features of Edmodo I really liked. While Edmodo was great, posting material in weekly bursts led to some odd features on the website that made things difficult if you wanted to change an assignment mid-stream. Because Edmodo is set up like a Facebook-style newsfeed, my system of posting daily assignments was thrown out of chronological whack if I changed one day’s assignment or posted a new one out of order because that would move to the top of the news feed and displace assignments that were actually due later in the week. While this isn’t an issue if one uses the calendar feature of Edmodo, it proved occasionally confusing for students when work changed mid-stream. If I happened to change an assignment, I’d have to change it not only on Edmodo, but also on my old CMS…it’s that darn double work-bind that I created for myself again! I was moving into a new situation with a new CMS and I hoped to work within the system in a way that replicated as much of Edmodo’s functionality as I could in a way that didn’t entail double work for me in posting my assignment. Engrade is a nice, cleanly designed, and highly functional gradebook. I used it because it didn’t involve all the clicking of my school’s CMS-linked gradebook and it always preserved all the data I entered. Plus, it had a very logical set of keyboard shortcuts and would auto-refresh within the window when you entered grades to show how those affected a student’s overall average. Engrade is a lot more than what I’ve described (e.g. calendar, student correspondence, homework posting, and a host of other features that make it a fully-fledged CMS), but given that I was already using Edmodo for that, it didn’t make sense to delve into those features of Engrade. Engrade also allowed me to experiment with giving students real-time access to their grades, which I wasn’t required to do at my previous school, but is a feature of my current school’s gradebook. Using Engrade in this way at my prior school gave me a taste of how that access shapes student perception about their work. However, much like point three for Edmodo above, I was happy to avoid any redundant work, and given that I have to maintain an open gradebook at my current school, it didn’t make any sense to host an off-site gradebook just for fun. Some of the technology features my current school uses helped dictate what my new approach to running my class webpage would be. For instance, the school uses Google Apps for Education and Gmail accounts throughout the institution, so it simply made sense for me to harness those resources as my colleagues and students would already be using them as well. My challenge was to figure out how to work with them in way that approximated (or perhaps bettered) the dynamic that I had established at my prior school with Edmodo and Engrade. One of the great features of Veracross that I didn’t have access to with my previous CMS centered on embedding media from other sources seamlessly. Once I discovered that I could easily connect my homework page on Veracross to Google Docs, my homework posting and communication solution became quite clear. What I began to do was write all my lesson plans and homework assignments in Google Drive, using a template I created at the beginning of the year that listed the week, the days, and what would happen each day both in class and for homework. Rather than keeping my lesson plan notes to myself, I typed them out on these weekly assignments in a way to make it clear to all parties involved (students, parents, colleagues, administrators, substitutes, the NSA, etc.) what was happening on a daily basis. Moreover, in these lesson plans I embedded links to YouTube videos, assignment sheets, PDF readings, etc. that were easily accessible in case anyone missed class or lost a handout that I distributed. I then collected all these files in folders organized according by Trimester. As a result, I now have one of the most thoroughly organized set of lesson plans and homework assignments that I’ve ever assembled. I would then publish each of these files and embed it into Veracross. The only trick I needed to figure out was that I had to resize the frame by adding a “width=600 height=600” before the URL of the Google Doc. The major benefit of embedding these Google Docs directly into Veracross was that I no longer had to make edits to my assignments in multiple places. If my plans or homework changed based on a unique schedule or discovering that the day didn’t go as I anticipated, it was supremely easy for my to make those changes just on my Google Docs and then have those changes echoed on Veracross instantaneously. For the students, my class webpage looked like this. From this centralized page, students could access the lesson plans, homework, and resources from any of the prior weeks. This feature proved particularly useful for my AP European History students, as they could access any of the older Chapter Review Sheets later in the year as they reviewed for the AP Exam. Based on some of the feedback I got from my students at the end of the year, they seemed to find this method useful and were confident that they’d be able to find the materials they needed for class or homework easily through this set-up. As an added bonus to this approach, when Veracross clears off all the webpages at the end of a prior school year, I don’t lose the work I’ve done, as I merely embedded the webpage into Veracross but didn’t invest tons of time typing homework and/or posting resources and links on Veracross itself. Instead, all the resource links I’ve compiled are embedded within my own Google Docs that I can revise and republish later. While this work took a lot of time this year, I anticipate that I’ll be able reuse much of it in future years. Moreover, I’ve often felt that I end up re-searching for many of the resources that I’ve used in previous years, and used but never wrote down in my planning book. With these Google Docs, which are riddled with hyperlinks, I now have a set of lesson plans that are a very thorough recap of what I did each day of the year. I’m eager to look at and think about these documents critically in upcoming years as I tweak my approach, the materials I use, and the way I sequence both the skills and the content. So while the pen-and-paper lesson planning method has gone by the wayside, I think I’ve developed a workflow method that certainly helps me both lesson plan and post materials for students in a streamlined way that avoids all the redundant aspects of my previous CMS-approach. So, in the optimistic hope that others have some thoughts on this issue, I’ll pose the question: what techniques, resources, websites, or other insights do those of you who use school webpages have for making your class’s online presence serve both your pedagogical goals and (ideally) make your life and classroom experience smoother? This past week I had my US History students looking at the variety of developments, economic systems, political arrangements, and connections with Native Americans that took place in the North American English colonies in the 17th and 18th centuries. To prepare for this, the students read background tertiary source overviews about New England, New York, Pennsylvania, and the Carolinas and Georgia from the University of Houston‘s online textbook, Digital History. 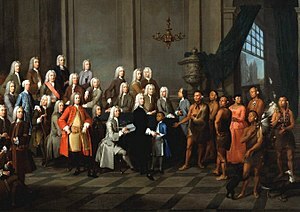 Then, with their readings and annotations in hand, I wanted the students to gain a broad understanding of these different colonies, think about the similarities and differences amongst them, and draw some conclusions about the dominant features of colonial life in these varied geographic and cultural contexts. While I’d ordinarily have students meet in small groups, condense their findings about these colonies in terms of a few different categories (in this case, social and religious context, relations with Native Americans, economic systems, and political structures), present these elements to one another, and draw synthetic conclusions about these pieces of evidence, I realized my grand ambitions outstripped my 45-minute class period. So, rather than work to get only part way there, I decided to instead seek out a venue where this collection and synthesis of information could take place simultaneously, which would then allow a bit of time at the end for follow-up, and would also provide the students with a comprehensive condensation of this evidence that they could then use for studying later on. Only one venue really seemed obvious to me: Google Docs! I booked class time in one of the library’s computer labs, set up a Google Doc (as opposed to a spreadsheet or presentation), populated it with a few different tables — one for the comparison of the colonies, one for significant similarities and differences, and one for synthesis of major trends — and then created a shared link for the document and posted it to Edmodo. When the students came in, I explained what we’d be doing, what the goals were, and then divided them into four different groups, each of which would work to create a comprehensive profile for one of the different colonies based on the categories I’d provided. Using the link from Edmodo was seamless and my first class got right to work. The one downside I experienced was that each contributor to the document was labeled “Anonymous User ###” rather than their Google username, which many of them had used to log into Google. Nevertheless, it seemed that accessing the document via the publicly shared link meant that they couldn’t attach their contributions to their Google account. As a result of everyone being an “Anonymous User,” it seemed that we were unable to use the “Restore Previous Version” feature as extensively as one could when one is actually logged into the document and it registers a username. This lack of connection with specific usernames meant that when we experienced a slight hiccup and had an accidental deletion of someone’s entry, we couldn’t quickly restore it as that deletion wasn’t attached to a specific user’s account. While I’m not positive that that’s what was going on, that’s my supposition. If anyone knows the actual explanation, I’d love to have some insight. Since I last experimented with a whole class working on Google Docs, it seems like the stability of the website has improved dramatically. Twelve students were able to simultaneously contribute, revise, and read one another’s work without any document crashes or any other catastrophic failures. While I need to remember to warn classes about the dangers of deleting one another’s work (and in general goofing around by highlighting random sections and clicking cursors around wildly, which can lead to accidental deletions of student work), I was pretty pleased with the amount of compilation and writing that the students accomplished in a short class period. Certainly, I need to continue reiterating that digital academic spaces are just like physical academic spaces, in that all the same rules of decorum, discourse, and respect for one another’s work applies. However, I like finding ways to get students to process material and generate useful products for themselves and for each other in synchronous digital venues that they couldn’t do in the asynchronous classroom environment. While this approach isn’t a silver bullet for all types of material coverage, I think it worked well here and is something I’ll likely visit again (and encourage the students to construct independently amongst themselves) throughout the course of the year. 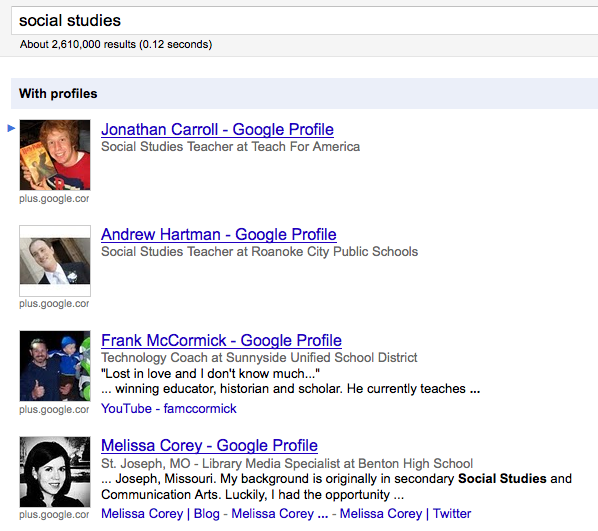 What experiences do others have in using Google Docs, or other collaborative digital tools, like this or in other ways? I’m giving my first test in my American Government class next Thursday, and am currently encouraging my students to begin thinking about organizing their materials and preparing for that assessment. However, as this group of students is sophomores, I’m striving to encourage them to develop more accountability in terms of determining which concepts and terms are the most significant ones from our unit of study. Certainly, I’ve encouraged them to do this as we’ve progressed through the readings; however, I think many students are familiar and comfortable with the “Review Sheet” format where they are given everything they have to know for the test, which I fear might encourage them to put off developing those skills of saliency determination in the course of a unit. So, as an experiment, I’m trying to split the difference of giving the students access to a review sheet, but simultaneously asking them to be the ones who generate the content of what is on that review sheet. For this task, I’ve employed a publicly accessible Google Doc, which I think will be new for many of the students. I’m not requiring any sign in information (though I may do that in the future) and am not making contributing to or even using the review sheet a mandate. However, I do think that this collaborative writing venue makes good sense for the task of building a review sheet, and I like the fact that Google Docs allows recovery of any prior draft of the document in case something tragic happens. In order to help the students get a sense of the ethics of using one of these online collaborative writing venues for compiling a review, I added a rather lengthy disclaimer about how the use the document, which I’ll share here. Instructions for and Ethics about the Use of this Document: For this collectively developed review, I encourage you to add key terms, concepts, ideas, etc. that we’ve discussed throughout this unit and define them if you so choose. I’ll provide the general categories we covered below, and then leave it up to you to work to identify which specific terms belong in each heading. Also, if you choose to define these terms, please explain both what the term is and, more importantly, why it is significant. I intend this document to be helpful to each of you, but if you choose to add a term, please put your name in parentheses after the term and/or definition that you add. Also note that because this a productive, public, academic space, I expect that the guidelines and decorum that holds in my classroom will also hold here. This expectation means that you are to use this space for academic purposes and no others. Finally, each of you who uses this document needs to be a critical consumer of the information that’s posted here. I hope this venue will be helpful for your review, but I can’t vouch for the accuracy or preciseness of the interpretations and analyses of significance that you or your peers post here. Therefore, if you’re uncertain about a term or concept, please consult the readings and discuss these terms face-to-face with your classmates or with me during our review day. Have others done something similar in terms of having students build a collective review sheet? What tools or resources did you use? What emphases did you give to your students? Did the unmonitored access to the document yield any problems that I haven’t anticipated here? While I’m not wholly enamored of the phrase “Personal Learning Network,” or its attendant acronym, PLN, that terminology seems to have become dominant and so I’ll go with it until something else gains precedence in the lexicon. In spite of my non-plussed attitude toward the PLN title, I do think that the presence of a PLN has been hugely influential in shaping my own teaching practice over the past three-plus years, and I hope to share with others how I’ve gone about building this an why I’ve found it so useful. A cursory Google search for “PLN” or “PLN presentation” yields oodles of hits on these topics, and I’ve seen a number of similar presentation titles at ISTE over the past two years, all of which indicates that this is well-trod ground, so I’m not anticipating making any earth-shattering contributions. Nevertheless, reflecting on my own PLN and my approach to using it has helped me consolidate a sense of which tools are the most valuable in facilitating this form of professional development. My primary goal in the presentation is to make the construction and use of a PLN, and the tools that are most essential for a PLN (and interesting question of priorities in and of itself), as accessible and pragmatic as possible. Therefore, focusing on the theory and value isn’t going to be something I stress as heavily, which instead will allow me to focus on specific resources, how I use them, and how they prove themselves helpful. However, I do think that it’s important to establish how this type of networking and information acquisition is different from a simple Google search — a distinction I find most evident in the ability to get specifically tailored types of information from sources that have been pre-vetted. The most obvious difference, perhaps, is also the ability to interact with the sources of one’s information rather than simply having to be the receiver of the information. Which of these is vital? Which of them should I omit? What have I missed that would be important to include? Where can I change my emphases? Without further ado, let me get to my quick recap of resources and emphases for each one. Twitter is vital in building connections to other educators and getting an up-to-date look at the resources that people are using, generating, and finding most helpful. I’ll provide a brief overview of some of the intricacies of the service and specific features (e.g. @replies, hashtags). Twitter provides powerful community building features by searching specific hashtags, e.g. #sschat, #engchat, #edchat, and others. The real power and value of Twitter comes particularly when one begins to use a third-party Twitter client like Echofon, Seesmic Desktop, Tweetdeck, or others. Once one has a network built up, Twitter can be incredibly helpful in getting feedback on ideas, lessons, classroom techniques, or research questions. Example of @ Reply to question on Twitter. Once you start finding resources and other educators, some of whom have blogs, finding a way to constantly track that information and have it accessible in one condensed location is important to make it manageable. Using an RSS Reader, like Google’s, makes this process very simple. Adding the RSS feeds from education blogs (or blogs related to other personal interests) helps one get a specifically tailored look at the topics in which one is interested. The search feature within Google Reader allows one to scour through sources that you’ve already selected as valuable. Moreover, the ability to “Star” and “Share” posts in Google Reader make it easier to track and remember ideas and resources that one found particularly helpful. Reading blogs and webpages within Google Reader is a pretty passive experience, but by clicking on the title of a post, one can go to the page of the post itself and then write a comment, thereby interacting in a more in-depth way with the authors of these posts. Google Reader also allows you to create “Bundles” of blogs that you’ve grouped thematically, making it easy to share with your colleagues a set of resources that you’ve found helpful. For instance, here’s the “Bundle” of all the Education blogs in my Google Reader. 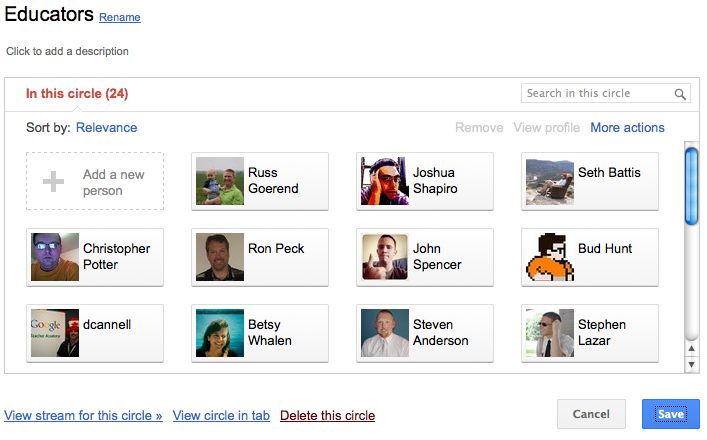 While relatively new, Google+ has some interesting features that make it a good venue for PLN interactions. The most notable of these is the ability to create “Circles” and group people according to the ways in which you want to interact with them. This “Circles” feature allows posts to specific constituencies, so that the message intended for your “Educator” friends doesn’t have to show up in the feed of your “Knitting Group” friends or “Kayak Enthusiast” friends. Interaction with and posting to others’ walls is intuitive and very similar to Facebook. However, Google+ has the added benefit of allowing you to edit your own posts in the event you misspell something or include the wrong link. Google+ also makes it very easy to find people who have common interests or expertise as you through their “Search” feature. Because it is very intuitive to add anyone to your circles, creating connections with these people and sharing your materials with them is quite simple. Honestly, I know less about these resources than the others I’ve mentioned in this post, but they were recommended by Richard Byrne, so I think they’re worth checking out. Richard stressed that PLNs shouldn’t be limited to Twitter or other micro-blogging resources, (a point he made here), so I hope this presentation effectively conveys that. Rather than the shorter-form interactions facilitated by Google+ and especially by Twitter, these websites include forums and pages dedicated to specific topics that remain static and more easily navigable than the ever-rushing stream of Twitter. Got nothing to write? Might as well re-blog yourself. In perusing through my RSS feed today, I noticed that ProfHacker posted their most recent installment of the Teaching Carnival, which always proves to be an interest overview of the most recent pedagogical blogging. Unsurprisingly, the reality of the real world (e.g. not summertime indolence) has caught up with me, so I’ve been relatively quiet on this front with essays, tests, and my own graduate work, but I’ve got some ideas brewing that will hopefully see the light of day soon enough. In fact, at this point I’ve completed the first official installment of the Crap Detection assignment and have some thoughts on what worked, what needs tweaked, and what other areas I need to emphasize to really drive home my point. In spite of the few shortcomings I experience, I nevertheless think it’s a valuable exercise that pushed my students to consider sources in ways they hadn’t before. So, thanks again to the ProfHacker folks for featuring my work, and I’ll look forward to perusing the other offerings in the Carnival (with preference given to those that are deep fried…hey, it is Texas State Fair season after all) soon enough. Yesterday I posted the PPT presentation that Russ Goerend and I used for our session at the Reform Symposium on Saturday night. Today, after having seen a tweet from Steven Anderson I discovered that the recordings of the session were now posted and available online. So, for those of you wanting to re-live the thrill of our session, or catch it for the first time (or catch it again for the first time…a bizarre/absurd phrase that I’ve cribbed from some commercial from the ’90s. If anyone can help me remember which one, I’d greatly appreciate your input…all my Google searches have been fruitless), here it is. Transitioning to an entirely different note, today I acquired an iPad. Thanks to the generosity of my school, I’ve been able to get this tool and have started thinking about how it could be used in various ways in my classroom. I really appreciate the opportunity to explore the iPad educational potential and hope that I’ll figure out some neat ways that it will play an integral role in helping my students’ learning and engagement. I’ve come across a few interesting resources related to the use of iPad in an educational context and have also drawn some other ideas from educators in my Twitter PLN. I’ll hopefully be putting together a post dedicated to this precise topic in the next few weeks before the school year kicks off that will reflect my thoughts and experiences using it during these waning weeks of summer. One idea that I took from Russ Goerend in a conversation we had before our Reform Symposium keynote is using the Simplenote app as a way to quickly and simply track a variety of things in one’s classroom — reading progress, behavior, success on assessments, and the like. To these ends, I can see using the iPad as a tool that will help me quickly gather and organize thoughts about my lesson plans and student observations. If I’m able to have the iPad readily accessible in my classroom and consistently make concise notes about students and their progress, I’ll be ahead of the game in terms of putting together comments at the end of the first quarter. Similarly, I also see the Dragon Dictation app as one that will help me work through my comment writing (or dictation, possibly) process more expeditiously. Today I attempted to dictate a sample comment about a hypothetical student with a degree of success — success being measured by how much tweaking/revising I’d have to do to make the comment accurate and grammatically correct. Interacting with the Dragon Dictation app on the iPad is much more pleasant than doing so on the iPhone, due primarily to the iPad’s faster processor and larger screen. Although having to email myself the finished text might be a slight hassle, I ultimately think I’ll come out ahead time-wise by dictating and editing versus typing. I guess we’ll see! 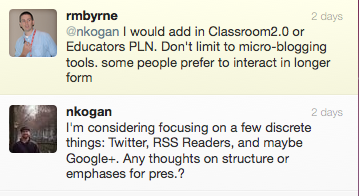 In my browsing thus far it seems like many of the suggestions for using the iPad focus on an elementary audience. This PPT presentation, entitled “12 Interesting Ways* to use an iPad in the Classroom”, has some interesting ideas about using the iPad for writing practice, making shapes, and making music — concepts that I’m not commonly engaged in teaching. The PPT does, however, have some suggestions that are applicable to multiple grade levels as it highlights the functionality of the Wolfram Alpha app and the GoodReader app. However, if I can find a really nice screen mirroring program (or if this feature comes along in the iPad OS 4 update) I can see a lot of use for the iPad Google Earth app, which makes flying to various parts on the globe and exploring terrain, climate, and resources much more immediate than doing so on the computer. Although the computer version of Google Earth is more robust (e.g. able to make narrated tours, use 3D layers, etc. ), being able to immediately fly to a particular region I’m discussing in World History could be extremely useful as I push students to, for instance, think about the role that the environment played in settlement or migration patterns. So, I hope to have a follow-up post fairly soon as I develop a clearer sense of the various apps available for the iPad and how they could function in my classroom. If you’ve already had success using the iPad in your class, or have come across great apps that you can see yourself using this fall in your classes, I’d love to hear about them. 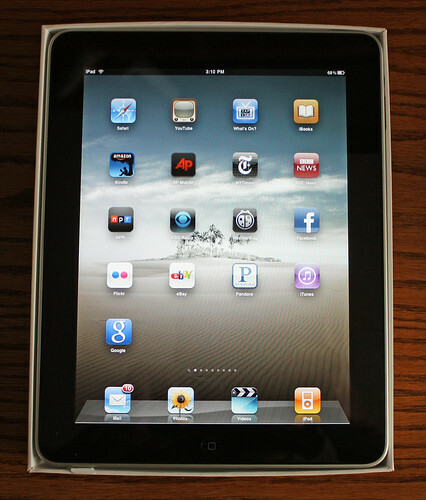 Similarly, if you know of good resources that have already been compiled about using the iPad in the classroom, I’d also love to know about those. Thanks!